When we posted our FirstLook of the Timex Expedition, a few readers commented that while Timex watches are nice, we really should take a look at comparable Casio units. These readers’ feelings were that Casio watches offer more value for the money. We are, of course, familiar with Casio. In fact, the first wristwatch we ever purchased (using our own “first real job money”) was a Casio multi-function Pathfinder (compass, altimeter, barometer). The Pathfinder, originally designed for the outdoor enthusiast, was an instant hit and a quickly became a must-have item for many gadget-lovers. Even though our Pathfinder is more than twenty years old, it still works perfectly and is one of the favorites in our collection. Emails triggered by our article on the iPod nano wristwatch reminded us of those exchanges. We have taken up the suggestion and have started a series on Casio’s new EDIFICE line. In creating the line, Casio managed to blend the versatility of multi-function features with the retro-look of analog dials, a mechanically-sophisticated combination typically available only on much more expensive watches. The key behind this is Casio’s proprietary “multi-function drive” approach to powering the different functions. Multiple motors operating independently allows unrestricted control of the various hands. This enables the watches in this particular Casio line to achieve a level of multi-functionality not possible by chronographs using conventional means. 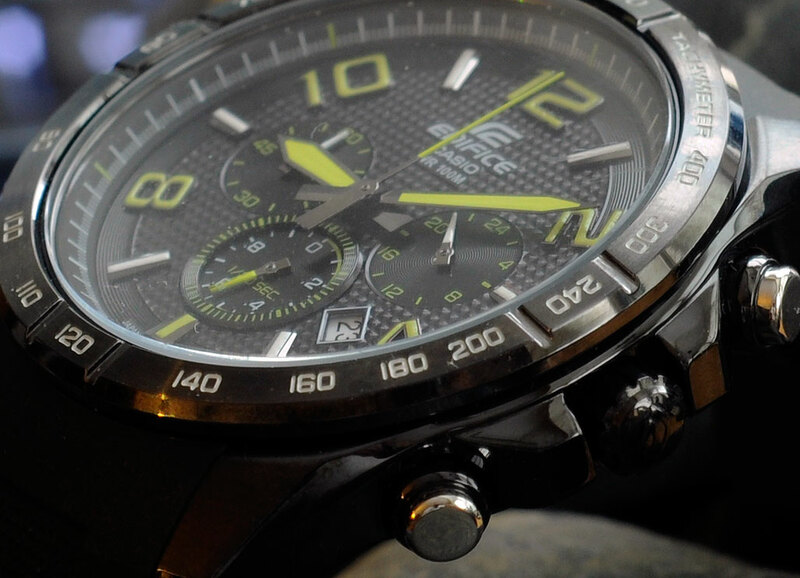 The first Casio EDIFICE in our review series is the EFR516PB Black Label unit (stainless steel case, ion-plated black). The watch face and all the dials are analog. The hands and hour indexes come in luminescent orange or green and are set against a gloss black texture background. The crystal is made of mineral glass and is surrounded by a non-rotating bezel. The watch is secured via a black resin band. The other functions of this Casio EDIFICE are activated/controlled by the push buttons on the right side of the case. The top button starts the stopwatch and the bottom button stop/resets it. Note that this particular stopwatch does not have split-time capability; a second push on the top button will resume the count from when it was stopped. The right dial is the 24-Hour/stopwatch’s seconds indicator. The middle dial is the 1/20 second hand. Its movement indicates the 1/20 second count during the first 30 seconds. The left dial is the stopwatch’s minute indicator. The number in the rectangular opening between the right and middle dials is the date indictor. A tachymeter scale is inscribed around the bezel. The spacing between the marks on the tachymeter dial are proportional to 1/elapsed time. This scale is used to compute a speed based on travel time or to measure distance based on speed. Readers unfamiliar with this capability can look forward to a writeup on the use of the tachymeter in one of our future articles. We will have a FirstUse report of this unit available by the end of July. If you are wondering how this watch will perform out InTheWild, we should have that answer next year. Readers who have been looking for an analog watch with chronograph functionality but were previously put off by the high cost of those types of watches should definitely check out the Casio EFR-516PB. 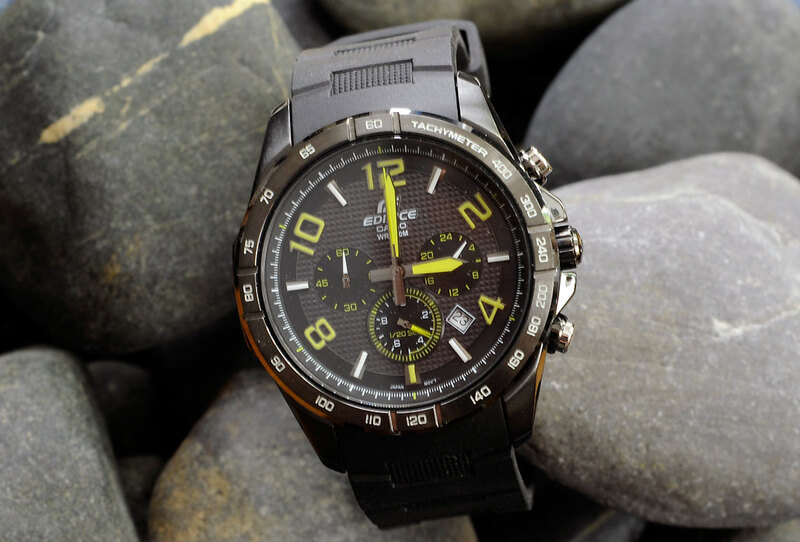 Casio has raised the bar for its competitors by packing some difficult to match features and aggressively pricing ($180 list, $120 via Amazon ) the watches in their EDIFICE line. We are quite impressed with our FirstLook of the Casio EDIFICE EFR-516PB and are looking forward to checking out some of its even more capable siblings later in the Summer.